The last few weeks Europe and North America were living on ice! 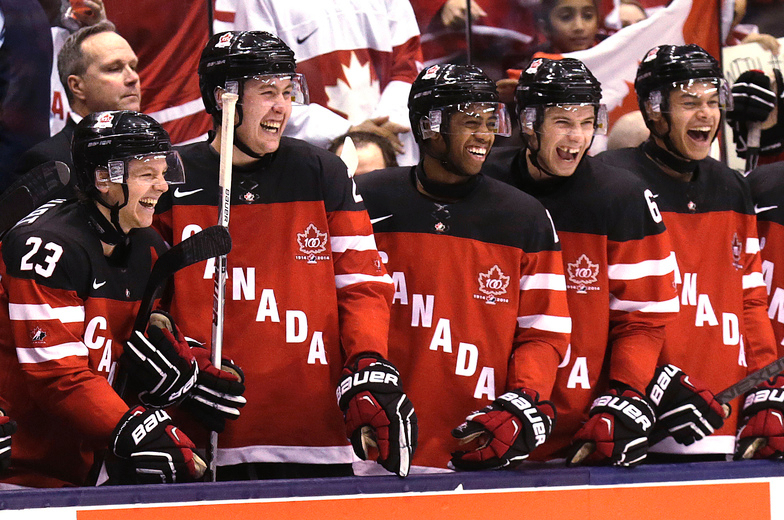 I’m not talking about the weather, but about great game of Ice Hockey – which is pretty much ignored here in UK for some reason :) In case you haven’t noticed – Canada wins world hockey gold for first time in eight years. Congrats guys! Slovakian hockey used to be pretty good – and whole country is still crazy about it. For me, it’s just a song about long forgotten days of glory, and I try to avoid unnecessary disappointments (we all have enough of those in our lives). Anyway this one is not so much about hockey itself but about funny colour consistence in the Hockey World Cup final in Prague, Czech Republic. I’m always amused how Russia manages to find someone else to blame, or discover incredible conspiracy, to confirm that the whole world is simply against them. :D True or not, I had a good laugh while reading it, so I thought it worth the translation – I quote: FreeJournal. “Ice Hockey Federation of Russia has accused UPA (Ukrainian Insurgent Army*) of lost with Canada. Ice Hockey Federation of Russia (HFR) strongly protested about the “psychological pressure” on the Russian hockey players during the final match of the World Cup. “The tournament organizers and competitors could not know that the colours in which Canadian team came out on the ice, may have a very negative impact on the Russian athletes. This explains the shock of the first few seconds, when the Russian team conceded the first goal…” – said HFR in their statement. Of course, no protests from the Russian side will follow, however, an unpleasant aftertaste for Russian athletes, spectators and the whole Russia remained. Well decide it for your self – below is a flag of the Ukrainian Insurgent Army so-called “Right Sector” – Rebels in West Ukraine. Dont want to go deep into the history but officially this Army was formed back in 1942. Ukraine was divided between Poland and Russia back then. Naturally Ukrainian people didn’t give up their freedom and this nationalist’s army was formed to fight for Ukrainian rights and their own officially recognized state. The main leader and a founder was Stepan Bandera – a Ukrainian political activist and leader of the Ukrainian nationalist and independence movement. That’s where revolutionist’s get their nick-name “Banderovci”. Despite their connections with Nazis, they did not fight for Hitler, neither for Stalin, they fought for the Ukrainian freedom! Whether it is true or not I hope you enjoyed my post. I will prepare a bit more about Ukrainian history for those who are into this historical stuff. Meanwhile have a look on Ukraine support page – any related images, photos and projects are more than welcome. Congratulation to Canada team! Well played, well done!